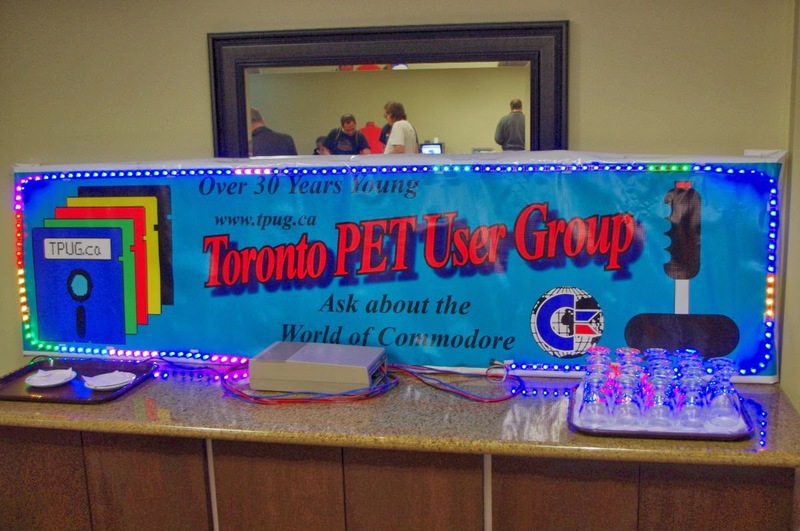 Yesterday marked an important event I've been looking forward to all year: The annual World of Commodore show, hosted by the Toronto Pet User's Group (TPUG). 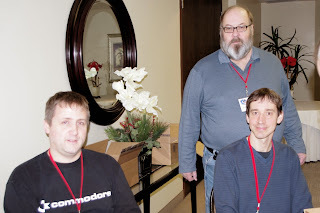 It's an annual event where I get to meet old friends, make some new ones, and revel in the shared nostalgia that is the world of Commodore computers. 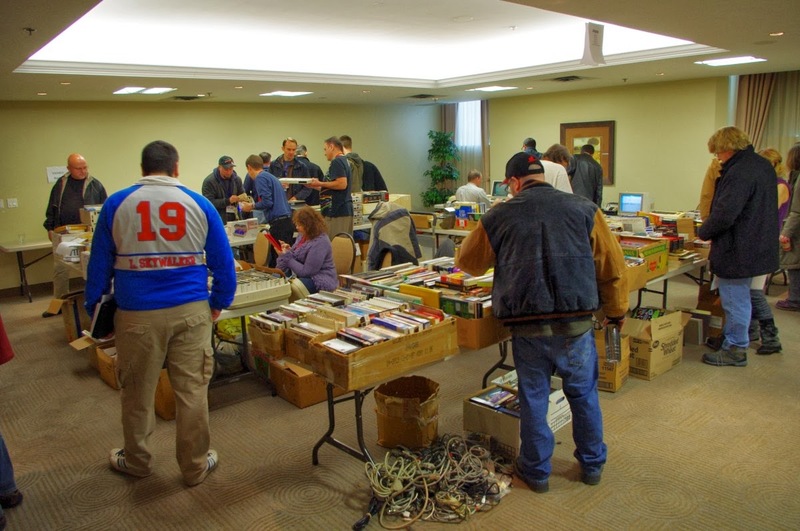 Taking place at the Admiral Inn in Mississauga, Ontario, it's apt that this annual event takes place not very far from where Commodore was founded. Greeted by the friendly smiling faces of Greg, Ian, and Tom, the entry fee of $10 for non-members and $5 for members represents excellent value. It was an opportunity for members like myself to renew our annual membership for a mere $10. 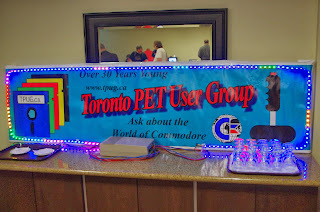 One of the things I really look forward to is meeting new people and enjoying the unique displays they put on for attendees. Loui, who operates a vintage computer museum, brought with him a small sampling of rare items, generously offering a hands-on experience. 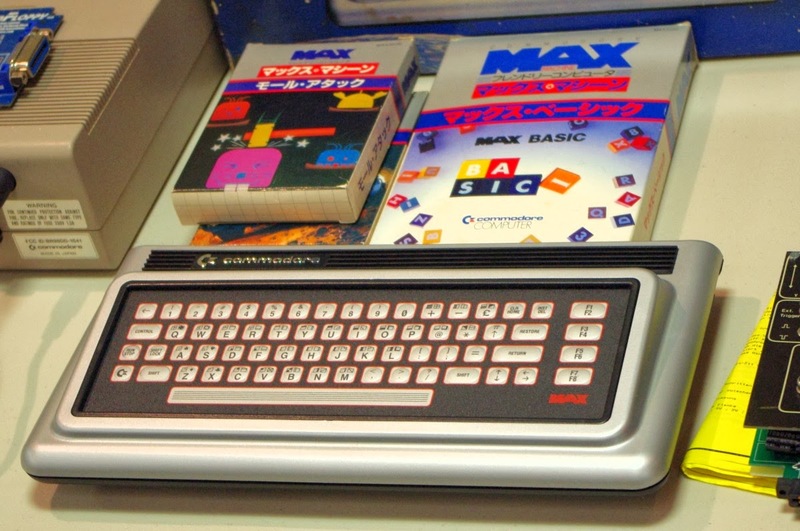 Notable were the Commodore 116, the Commodore MAX machine, and a box for developers of the Commodore 64. 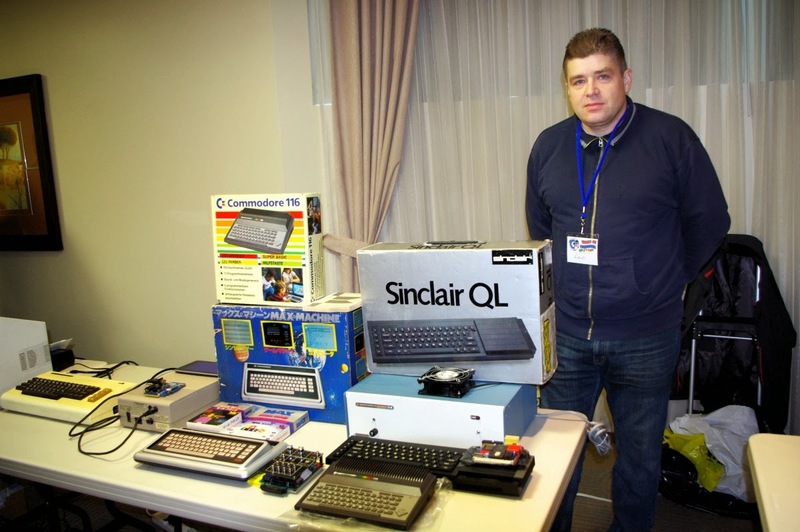 Loui was very knowledgeable and friendly, providing a unique insight and background to each item in his collection. 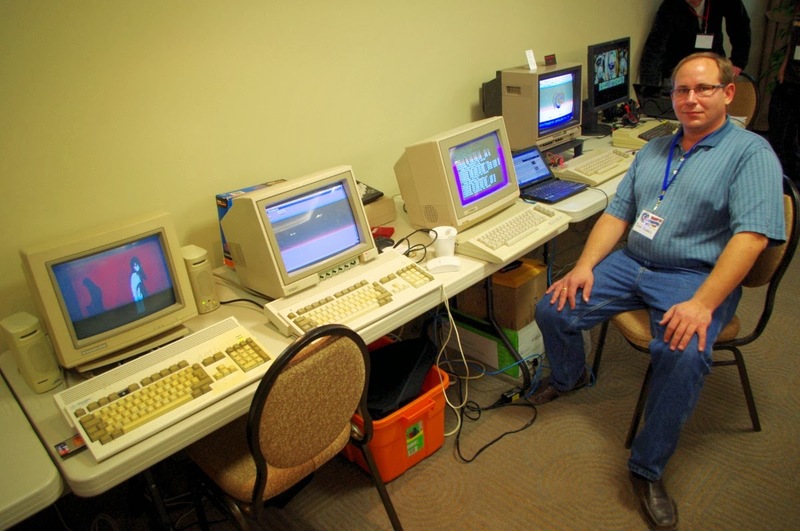 My friend Dan was present, with two Amiga 1200's and a Commodore 64 on display. One Amiga 1200 was playing Youtube videos, while the Commodore 64 played various demos and was connected to the hotel network. 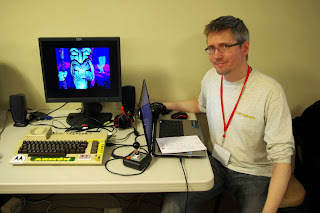 I was impressed with a demo of Still Alive from my favourite game, Portal, playing in razor sharp high resolution on his Commodore 64. 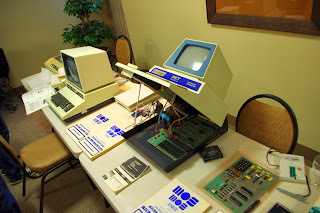 It appeared to show a true 80 column display. A regular at World of Commodore, Joe of JP PBM provided his usual variety of Commodore hardware and software, both new and old, for very reasonable prices. 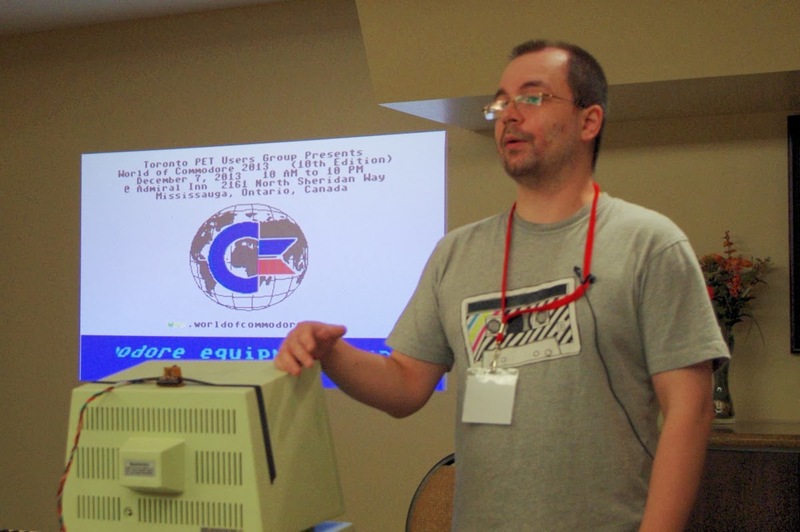 I was able to buy JiffyDOS for my Commodore 128 from Joe. 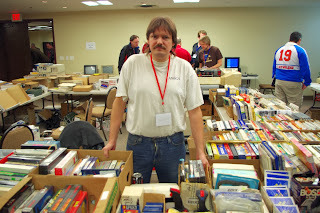 Joe is also a great source of information, and a great guy to talk to. He's definitely an asset to the Commodore community in this area. 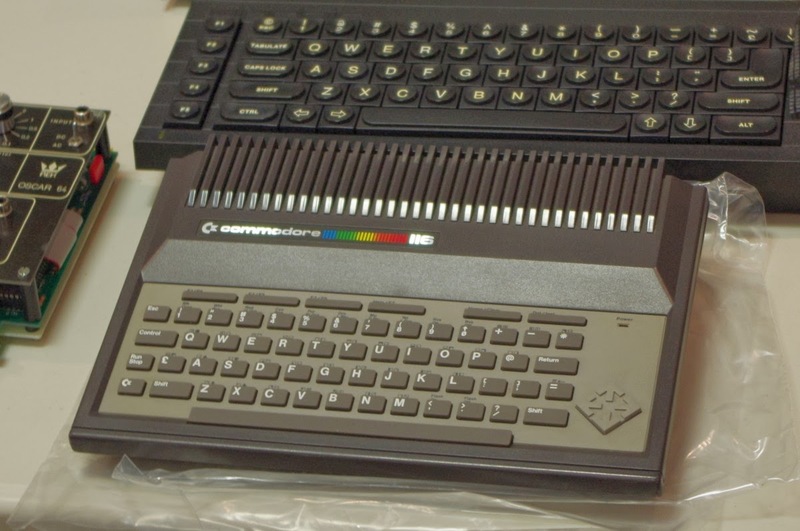 There was plenty of opportunity to buy vintage Commodore goodness from TPUG, with Amigas and 8 bit Commodores for sale, along with their peripherals, software, cables, manuals, magazines, and more. As usual, there was a freebie table, where I saw a Commodore 128, some Commodore 64's, 1541 disk drives, monitors, and various disks, magazines, and programs. 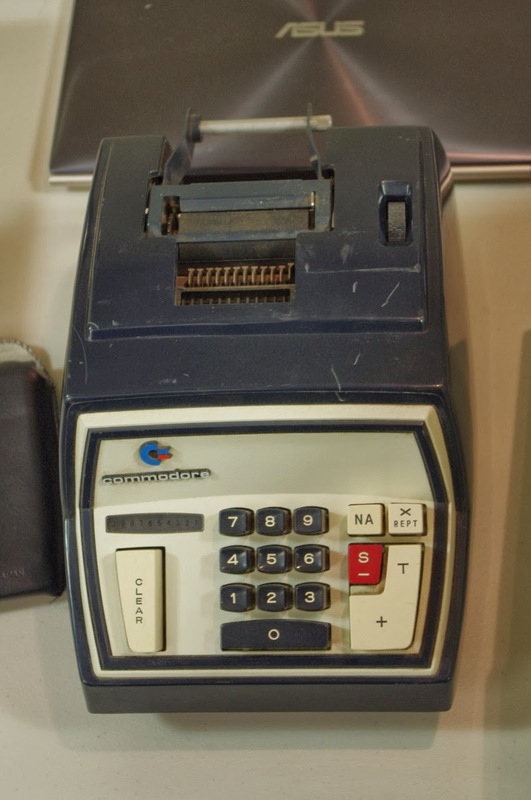 There was also the traditional raffle table, with prizes including a Commodore calculator. There really was something there for everyone. The first to present was Matt Brudzynski of Comma 8 studios, returning to provide us with an update from last year's presentation. 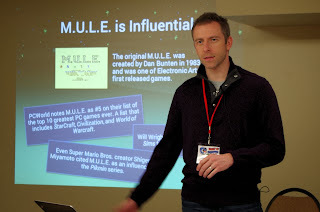 Having brought a modern version of M.U.L.E. to iPhone, Matt provided us with insight to the ongoing process and challenges of this endeavour, sharing with us the harsh criticisms and praise he's received. He's going to use the lessons he's learned thus far to update this great game. 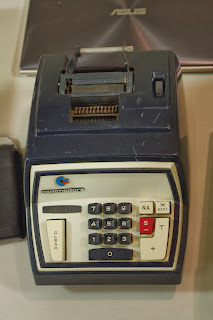 I'm looking forward to the Android debut. 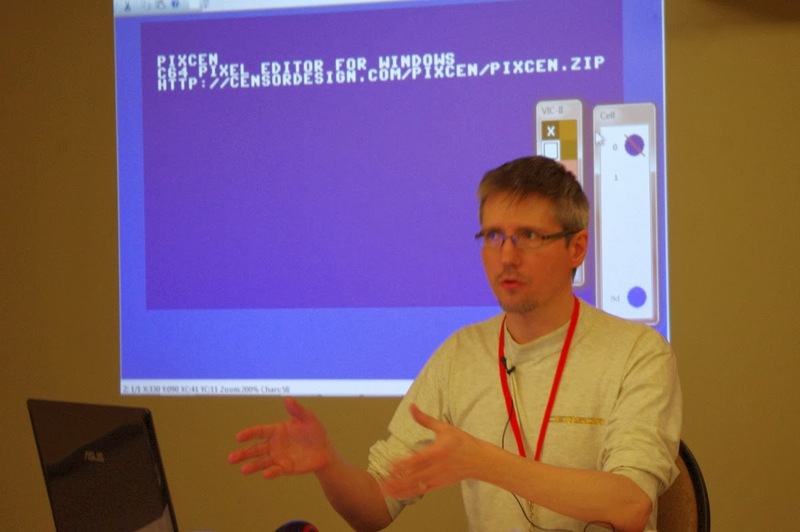 Next up was John Hammarberg of Censor Design, demonstrating Pixcen for Windows. 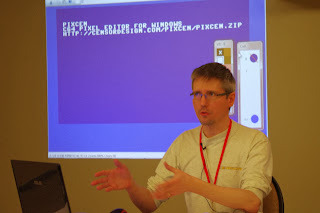 Pixcen is an open source application that makes it easy for developers to develop graphics and sprites for their games and demos on the Commodore 64. John's demonstration provided us with a how-to on how to get the most out of this development tool. 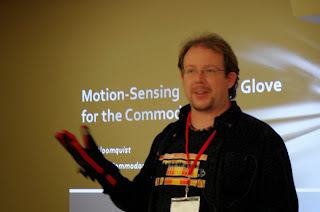 Another regular at World of Commodore and Commodore events in general, Leif Bloomquist demonstrated his wireless motion sensing glove for the Commodore 64. 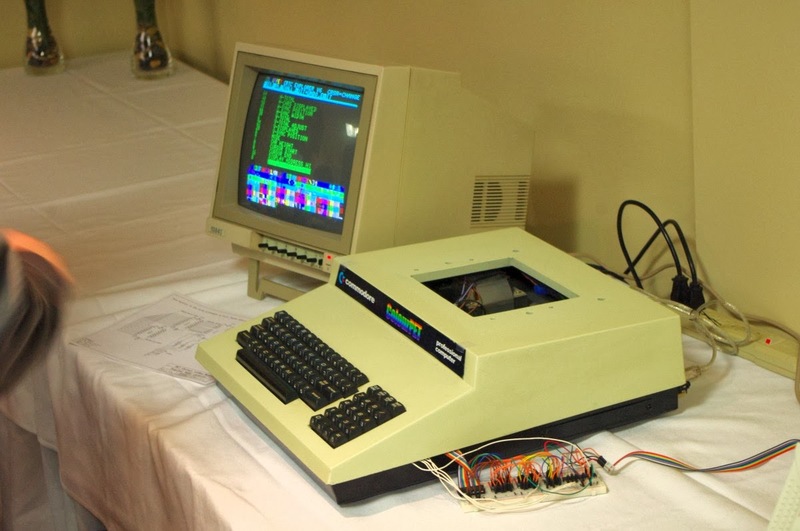 Leif began his demonstration by explaining the background on this technology, the SoMo by SonicWear, and how he arrived at the idea of implementing it on the Commodore 64, detailing the reasons why he chose the materials he did. 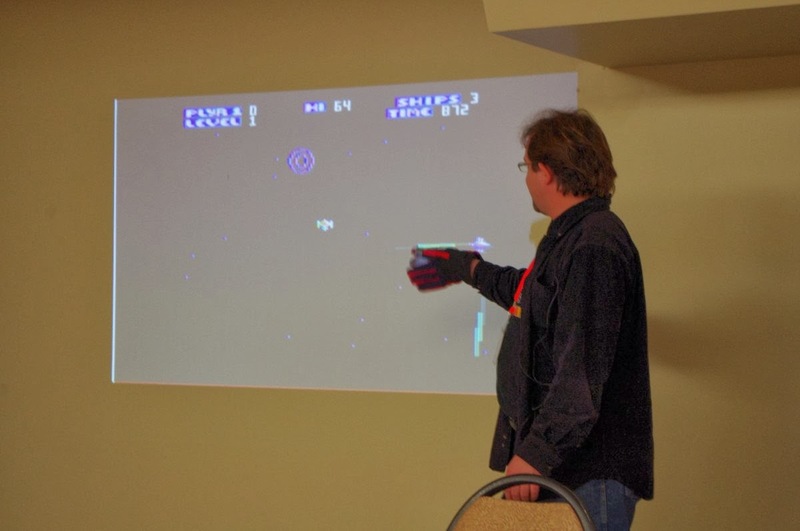 He then provided a demonstration on his favourite game, Zone Ranger. After his presentation, Leif provided opportunity for attendees to try out his glove on various games. 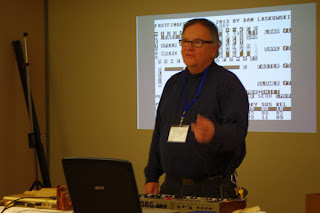 Next up was Chiron Bramberger, demonstrating his musical experiments on the PET. In his demonstration, Chiron explains the challenges he faced in getting sound from the PET, how he discovered another voice in the PET with the discovery of another oscillator, and how this lead him to discover other voices in the Commodore 64 and Vic 20. He then treated us to demonstrations on how he was able to extend the tonal range of the PET, provide stereo output, and how he made effective use of his discoveries to generate musical tones from the PET. Keeping with the theme of the musical arts, Dan Laskowski provided us with a demonstration on how he made effective use of MIDI with Fastfingers for the Commodore 64. Most interesting was his ability to translate the velocity of pressure on a key of a KORG keyboard to change the output of the sound being generated. There was plenty more to see...a working colour PET, a KIM-1, an original PET, interesting case and system modifications, and interesting stories from some great people. It was a day filled with fun, wonder, and vintage computing goodness. I'll leave you with these pictures of the event to enjoy. I need a replacement keyboard for my 128. I have 10 of these 128's. 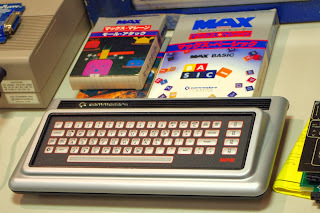 Have exhausted the keypads. 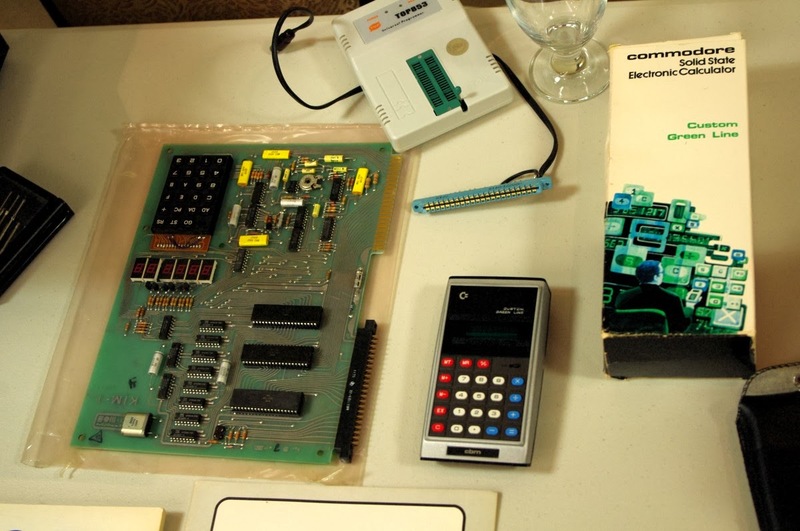 Should be some kind of mechanical board that can rewired to 8x8 matrix. Anyone got any ideas..build my own? Exhausted the keyboards? They should be repairable.